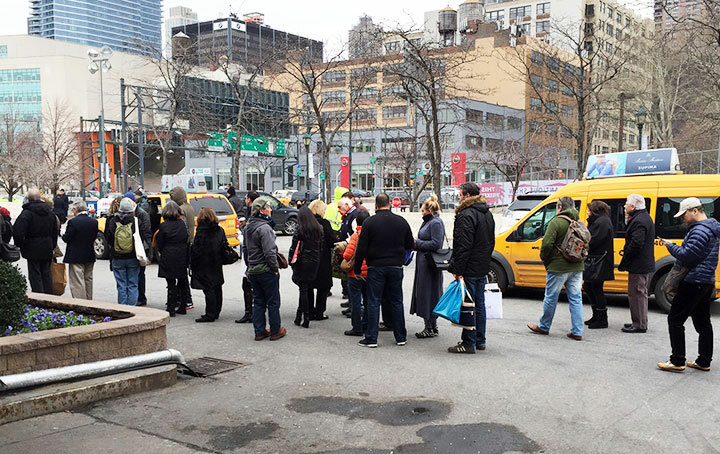 The NYC Pier Antique Show ended its two-day run yesterday, March 29, 2014. Attendance started out strong on Saturday, with two lines extending outdoors. Interest and sales were both good, with Saturday’s sales alone easily exceeding all of last year’s March show. The show was noticeably smaller, with the rumor going around that there were 100 fewer dealers. It was quite evident walking around, but it was still a very nice show. I assume many dealers didn’t come back because they did poorly last year. That was certainly the case for me, but it appears that last year was a fluke. I’m guessing that part of the reason dealers did well this year was because the public’s spending power was spread over fewer dealers. Sunday started out like a ghost town, as one would expect at 10 AM. In fact the attendance didn’t pick up noticeably until 2:30 PM and then it wasn’t as busy as Saturday. Why the promoters insist on 10 AM – 6 PM on Sunday is beyond my comprehension. 11 AM – 5 PM would result in the same business for all the dealers and a much needed rest on Sunday morning. At a minimum, the hours should be 11 AM – 6 PM. Six hours are more than enough, but seven hours seem like a reasonable compromise. Dealers, speak up if you agree with me. US Antique Shows, are you listening? In asking around, I solicited the following comments. From Ron Greenwald, Greenwald Antiques, Cleveland, OH, a decorative arts dealer, “Our show was OK. Yesterday was exciting. Sunday was uneventful. 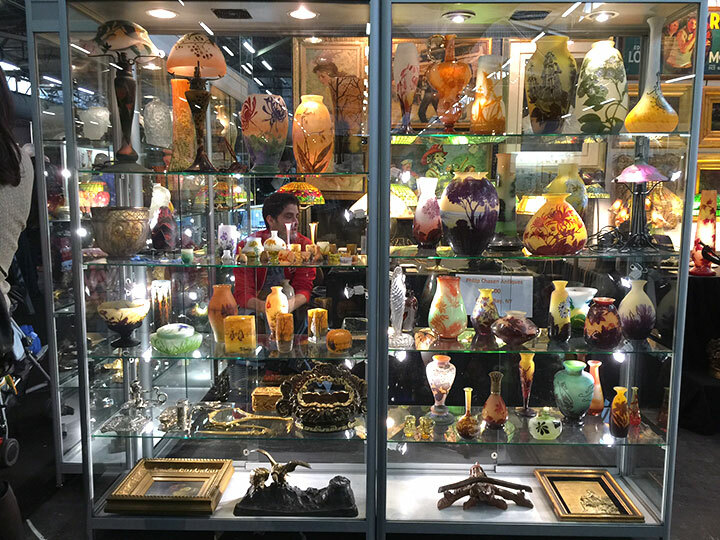 We equaled our expectations.” Adele and Alan Grodsky, lamp and art glass dealers, Cooper City, FL, told me “The show was OK. We sold lamps and Tiffany art glass. We’re pleased with our results.” Bill Holland, hollandarts.com, Icart and Tiffany desk set dealer, West Chester, PA, was disappointed. “Fair, C-. Last year was better. I was disappointed with buying from other dealers because there were fewer.” Jeff Meyers, decorative arts dealer, Chicaloon, AK, was pleased. “The show was very good. There was a lot of interest in modern glass, especially Murano. I was happy the way the show turned out.” George Sorensen, George Sorensen Antiques, art glass dealer, Minneapolis, MN, commented “It was an average Pier show. I’m satisfied.” Ed Hill, Any Antique Will Do, silver and gold dealer, Hopkinton, RI, said “We did well. We equaled our expectations.” Virgil Rogers, Only Authentics, handbag dealer, New York, NY, was satisfied. “It was a little above average for the spring show. I’m pleased.” Personally our show was head and shoulders better than last year, so we’re pleased. 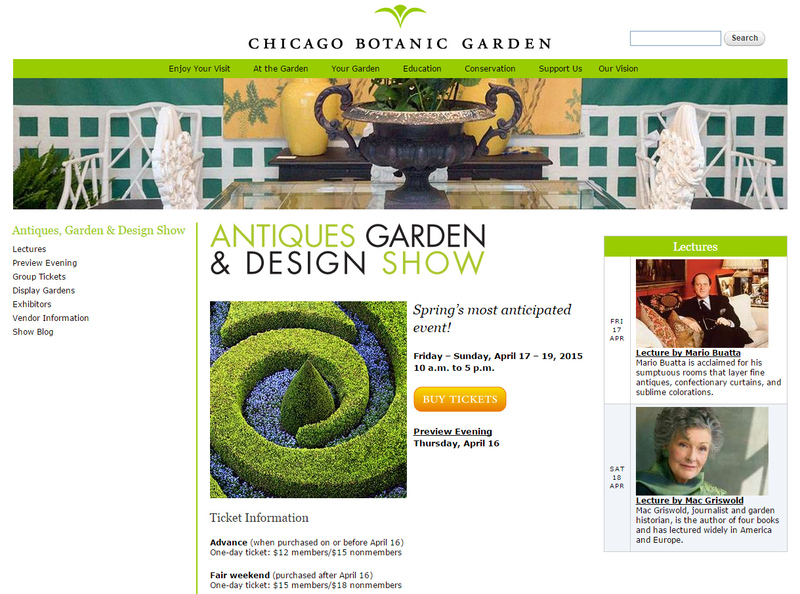 Next we’re off to Chicago for the Garden, Antique & Design Show at the Chicago Botanic Garden in Glencoe, IL, (a north suburb of Chicago), April 17-19, 2015. We’re down to only two shows in the greater Chicago area, so don’t wait for the Merchandise Mart or the Navy Pier. They don’t exist anymore. Come and visit us in Glencoe or you’ll be out of luck until we return to Winnetka in the fall. Yesterday was the first day of setup for those willing to pay a little extra. Only a few dealers did, so the Pier was mostly empty, except for the union workers arranging the show. 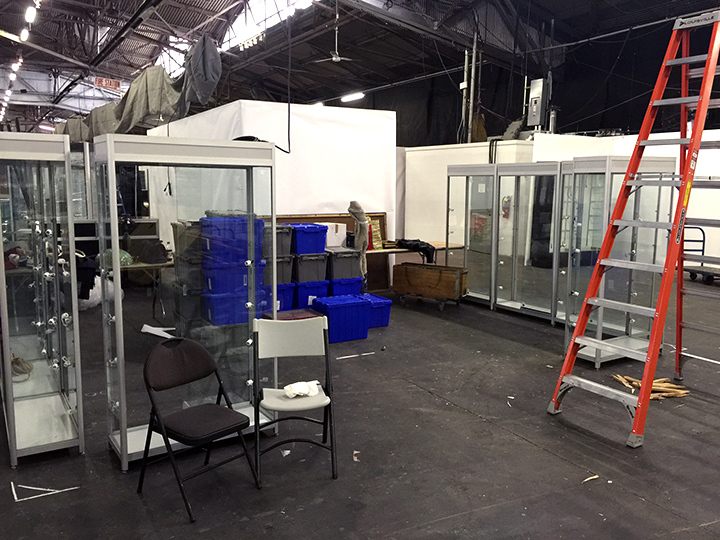 We only had a few hours in the afternoon, but without having to compete with other dealers, we were able to get a lot done in a short period of time. We’ll finish the job today and be ready for the mob that’s expected tomorrow, Saturday. The show will open to the public at 10 AM and continue until Sunday, at 6 PM. It’s short and sweet — no waiting for the results. Either you did well or not. Tune in on Monday for the results! We’ll next head to Chicago in a couple of weeks for the Garden, Antique & Design Show at the Chicago Botanic Garden in Glencoe, IL, (a north suburb of Chicago), April 17-19, 2015. We’re down to only two shows in the greater Chicago area, so don’t wait for the Merchandise Mart or the Navy Pier. They don’t exist anymore. Come and visit us in Glencoe or you’ll be out of luck until we return to Winnetka in the fall. 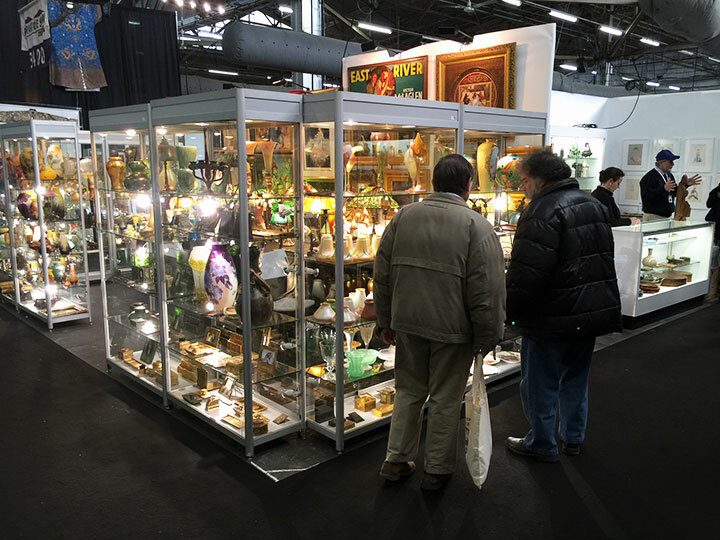 The NYC Pier Antique Show will open to the public this coming Saturday, March 28, at 10 AM, and close the next day, Sunday, March 29, at 6 PM. It’s a popular bi-annual event attended by eager collectors, dealers and decorators, some from as far away as Japan. We only have two shows left this spring, then a big break before our summer shows. After the NYC Pier show we’ll travel to Chicago for the Garden, Antique & Design Show at the Chicago Botanic Garden in Glencoe, IL, April 17-19. We’re bringing an extensive group of American and French glass and lamps. The selection will be large, with outstanding examples by Tiffany, Daum and Gallé. Thursday’s blog will be delayed to Friday, so I can write from the floor of the NYC Pier Antique Show. Next Monday’s blog will have the results of the show. OK, I lied. I said no posts this week because we’re on vacation, but I did have time to write this quick one. 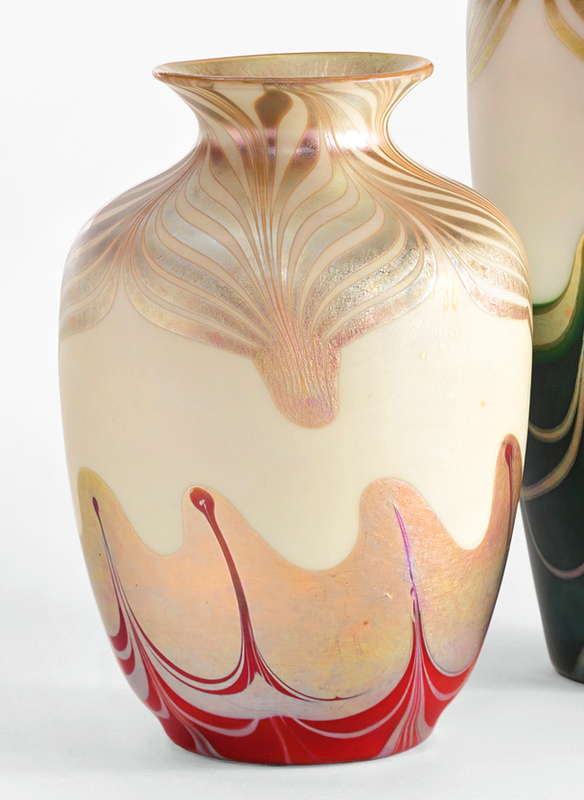 Leland Little held a Fine & Decorative Arts auction on March 14, 2015. 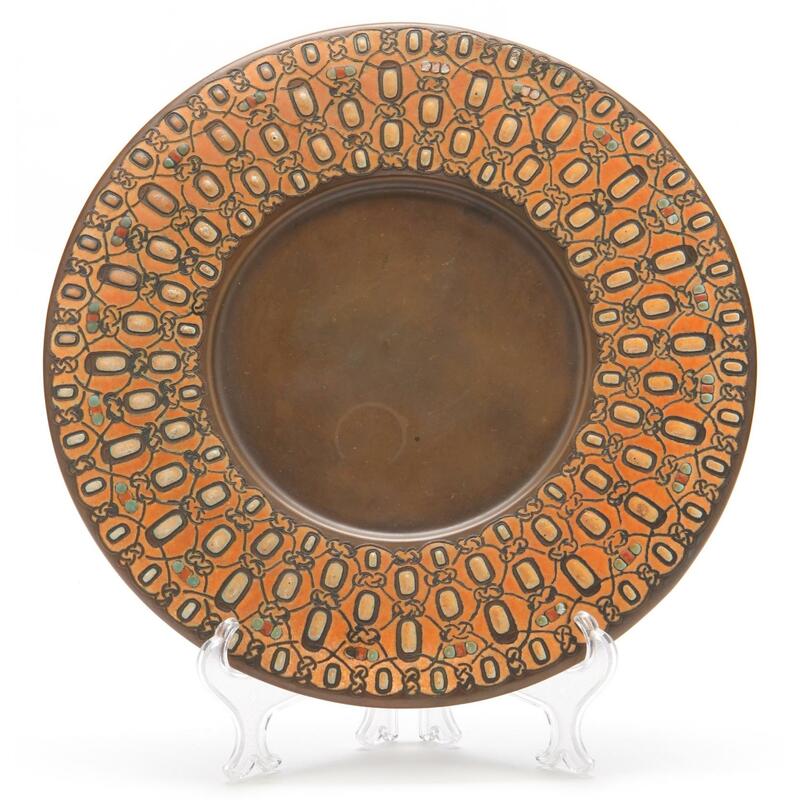 Included in the sale was lot #590, a 12″ diameter Tiffany Studios bronze charger with enameled decoration. It sold for a whopping $13,310, against a pre-sale estimate of $200 – $400. So what gives? How could a plain-looking charger bring so much money? Easy. First, it was fresh to the market since the 1960s, when it was purchased from Lillian Nassau. Nice, but not key. The key was the signature, “L.C. Tiffany, 196 A-Coll.” Items marked “A-Coll.” were in Louis Comfort Tiffany’s personal collection — oooh, now I understand! We’re vacationing this week. 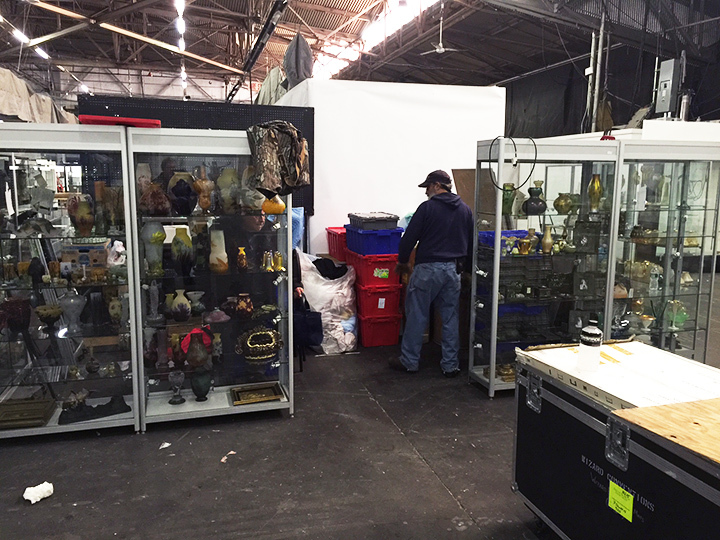 We’ll be back in time for our next show, next week at the NYC Pier Antique Show, March 28-29, 2015. Leslie Hindman Auctioneers held their Louis Daniel Brodsky Collection of Art Nouveau sale on February 22, 2015, selling the estate of the late poet. Results were good, with sales totaling $1,049,319, against pre-sale estimates of $437,570 – $693,430. All 347 lots sold, for a 100% sell-through rate. Phone and online bidders from 15 countries vied with the audience in the full saleroom. 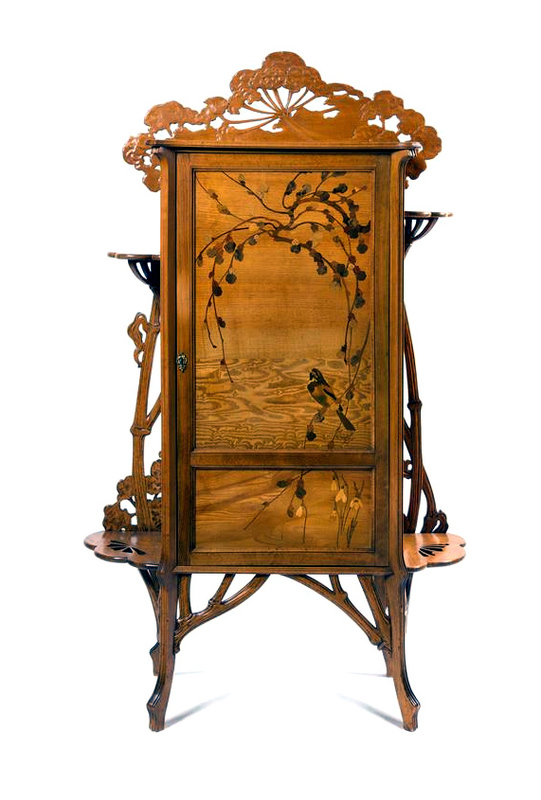 Two furniture lots tied at $35,000 for top lot of the sale — #20, a French Art Nouveau rosewood vitrine, against a pre-sale estimate of $8,000 – $12,000 and #42, an Émile Gallé marquetry cabinet, against a pre-sale estimate of $5,000 – $7,000. 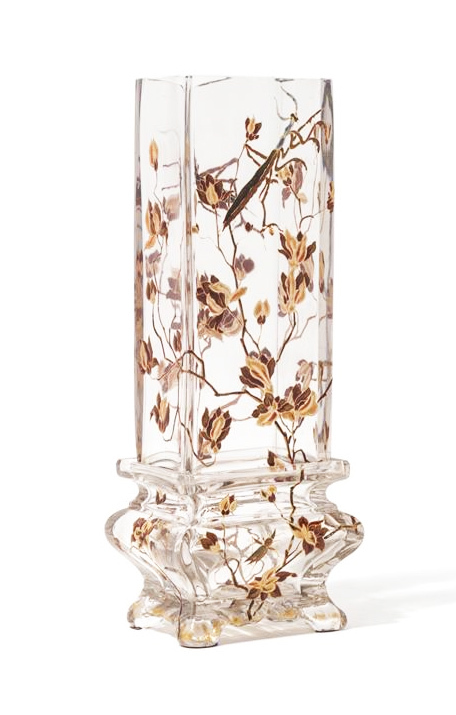 Brodsky favored early Gallé glass — clear Crystallerie with hand-painted motifs. 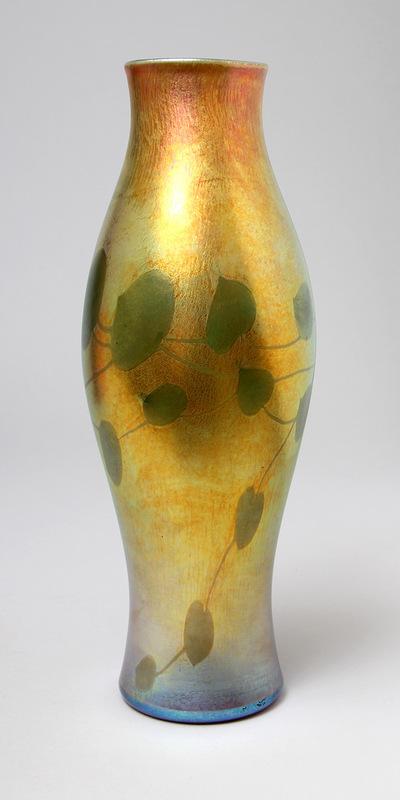 Top lot of this group was #2, an interesting rectangular vase with flowers and two praying mantises. It sold for $10,625 — double the high estimate of $5,000. 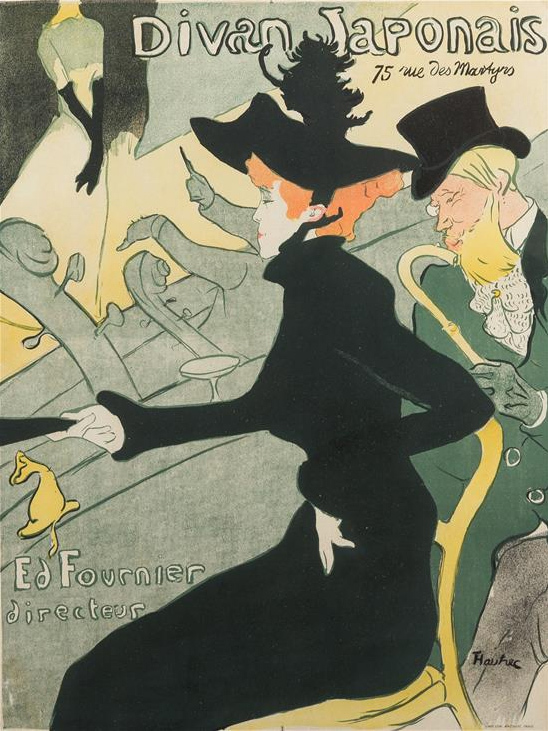 Of the posters that Brodsky collected, lot 99, a Henri de Toulouse-Lautrec example, entitled Divan Japonais, 1892-93, sold for $30,000, against a pre-sale estimate of $10,000 – $20,000. Now for a little down time and a lovely vacation. 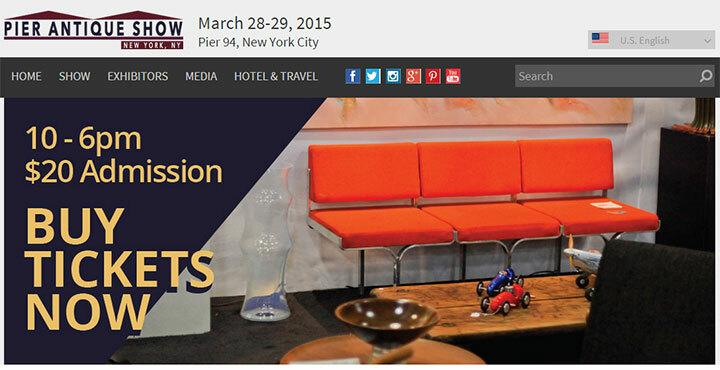 We’ll be back in time for our next show, the NYC Pier Antique Show, March 28-29, 2015. Chicago is a great city for antiques. Its large population and centralized location allow it to draw collectors and decorators from all directions. There’s good interest from the affluent community of the greater Chicago area. You would think it could support many antique shows, but they’re mostly gone. So what happened? I wish there were some clear answer, but there isn’t. Ten years ago, we would come to Chicago to exhibit at 5-6 shows annually. Now we’re down to 2 — Winnetka in the fall and the Chicago Botanic Garden in the spring. Amazingly there isn’t a single show left in downtown Chicago. Here’s a little history. 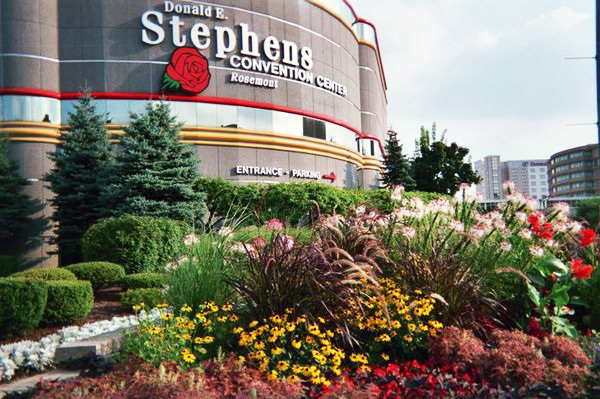 Dolphin Promotions used to hold a show at the Donald E. Stephens Convention Center in Rosemont, IL. At one point, the show was held three times a year, with approximately 200 exhibitors. I loved that show. Buying was easy. Attendance was great. The show was easy to setup. Vehicles were permitted to drive onto the show floor. The hotels were right across the street. Listen to my very big nostalgic sigh! As dealers started to drop out and fewer people attended, the show was cut to once a year, until it finally closed. I sure miss that one. The antique show at Arlington Park Raceway was one of the best in the country many years ago. There were three floors of dealers and 30,000 visitors! After the fire at the racetrack in July of 1985 (click here for the video), the promoter, Charles Wheatley, moved the show temporarily to Donnelly Hall at McCormick Place (click here for the article from the Chicago Tribune). Unfortunately he never restarted the show at Arlington after the racetrack’s reconstruction. (Scratch my head about that.) Many years later Dolphin Promotions restarted the show to moderate success. The show was then sold to Shawn Hastings, who unfortunately ran it into the ground. It closed a few years ago. The story in downtown Chicago is even more unfortunate. 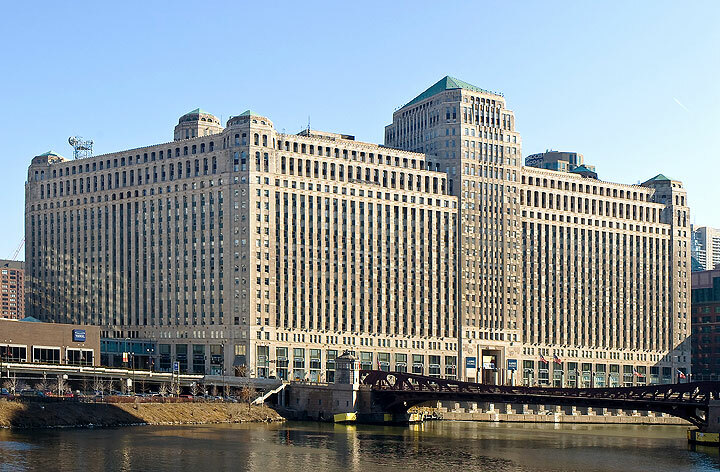 For years, the Merchandise Mart ran a very successful show. At one point it ran twice a year, but later was cut to once a year in the spring. Two years ago, the Palm Beach Show Group decided to come to Chicago. Here the details get a little murky, but to the best of my knowledge, they tried to negotiate with the Merchandise Mart. After failing to reach an agreement, the Palm Beach boys decided to do battle with the Merchandise Mart. They started a new show at the Navy Pier to compete head on with the Mart. Dealers were forced to choose between the two. The Mart caved and the Palm Beach boys won the battle (but apparently not the war). The Palm Beach Show Group held a show at the Navy Pier last year that was not well received. They couldn’t get enough dealers to resign for 2015, so not only will there not be a Navy Pier show, there won’t be a Merchandise Mart show either. Sounds like a case of killing the goose that laid the golden eggs. I don’t know if either the Merchandise Mart or the Palm Beach Show Group will revive either show. Personally I would like to see an agreement where the Palm Beach Show Group runs the show, but the Merchandise Mart hosts the show. The earliest that could happen would be the spring of 2016. Since they couldn’t work out an agreement for 2015, I’m pessimistic there’ll be a show next year. I hope I’m wrong. So what does that leave? The Antiques, Garden & Design Show at the Chicago Botanic Garden, in Glencoe, IL, a beautiful suburb north of the city. It will be held this April 17 – 19, 2015, 10 AM to 5 PM, Friday – Sunday. We’ll be there and we hope you will too. It’s a fun show that combines antiques and gardening. If the weather is nice, some of the flowers will be in bloom, but there are no guarantees. Chicago weather is fickle — it could be 40° or 80°. But we’ll be indoors and not subject to the weather. This will be your only chance to see us at any antique show in the greater Chicago area until the Winnetka show in October. Make your plans now. You’ll enjoy the show! Sotheby’s New York held its 20th Century Design sale on March 4, 2015, with good results. Sales totaled $2,621,379 for the 218 lots offered. Of those, 168 lots sold, for an average of $15,603. 50 lots failed to reach reserve and did not sell. Considering the selection was weaker than the main sales in June and December, the results were impressive. 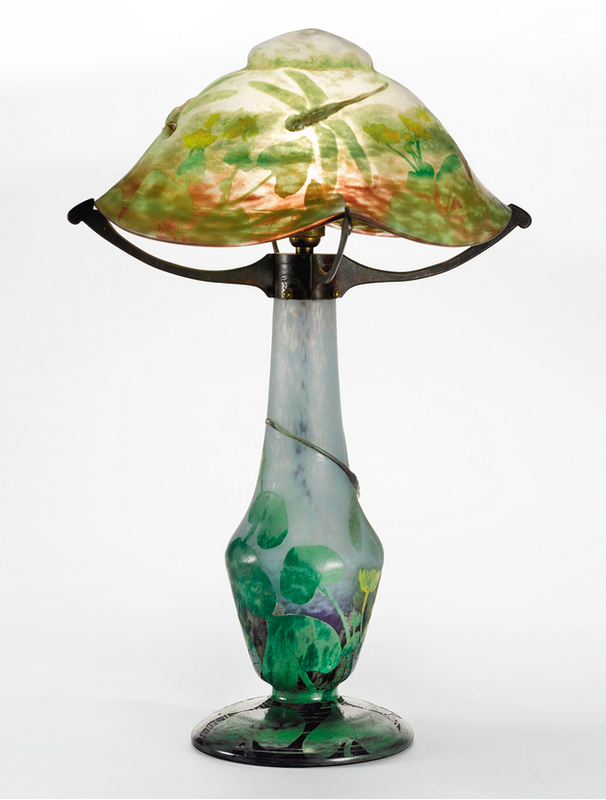 Lot #11 was one of the better Tiffany lamps — a 7-light lily with decorated shades. Most lily lamps have gold shades, so it was nice to find an example with unusual shades. The lamp was in nice condition, except for one mismatched gold decorated shade (visible in the rear). Regardless, it sold for $40,625, including buyer’s premium, against a pre-sale estimate of $12,000 — $18,000. 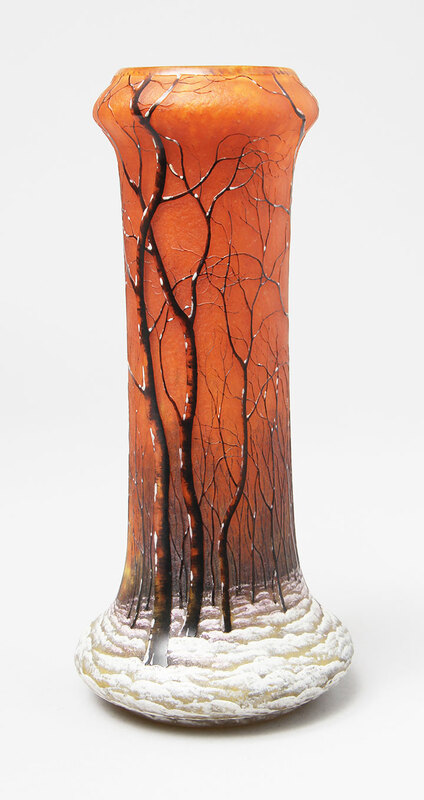 Several lots of Steuben glass crossed the block, with #18, a fine red decorated vase, selling well. It brought $11,250, against an estimate of $7,000 — $9,000. I didn’t like lot #46, a rare Daum Dragonfly lamp, so I didn’t bid. The shade didn’t match the base well and I had a suspicion the base was shortened. I also had doubts about the authenticity and originality of the hardware — it just didn’t look right to me. However, the bidders didn’t ask my opinion first, and pushed the lamp to $43,750, against a pre-sale estimate of $20,000 — $30,000. The nature of live auctions has changed with the advent of the Internet. It used to be that most auctions were attended by many people. For some it was the Saturday night entertainment. Today, most auctions are lightly attended, but not neglected. The action comes from the Internet and the telephones. It’s now possible to bid live from anywhere on the planet, at almost any auction, with an Internet connection. 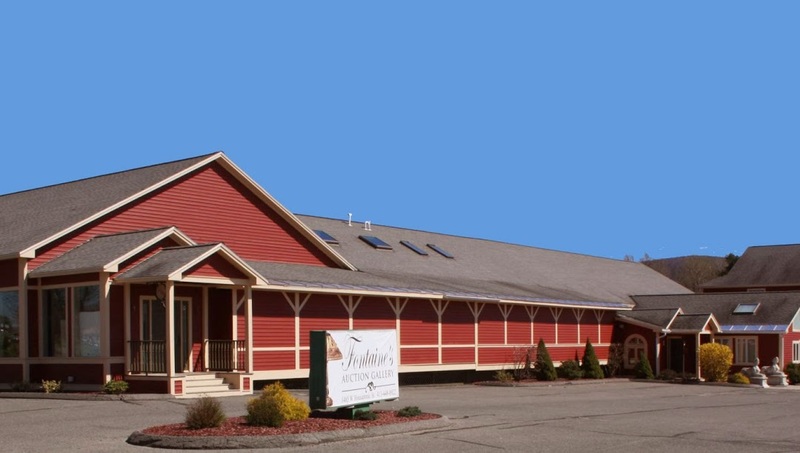 And that’s exactly what happened at Fontaine’s Auction Gallery on Saturday, February 28, 2015. There weren’t many people in attendance, but items sold well even with light in-house bidding. The phones and the Internet took up all the slack. What was different for us is that we were in attendance. We rarely attend live auctions anymore. I forgot what torture it is to sit through a six-hour auction in a fairly uncomfortable chair. We decided to attend this auction because Fontaine put together a great sale, with lots of fresh, important merchandise. It’s always best to inspect items in person, as many appear better (or worse) than the photos. It seemed that almost everything went above high estimate — some way above high estimate. 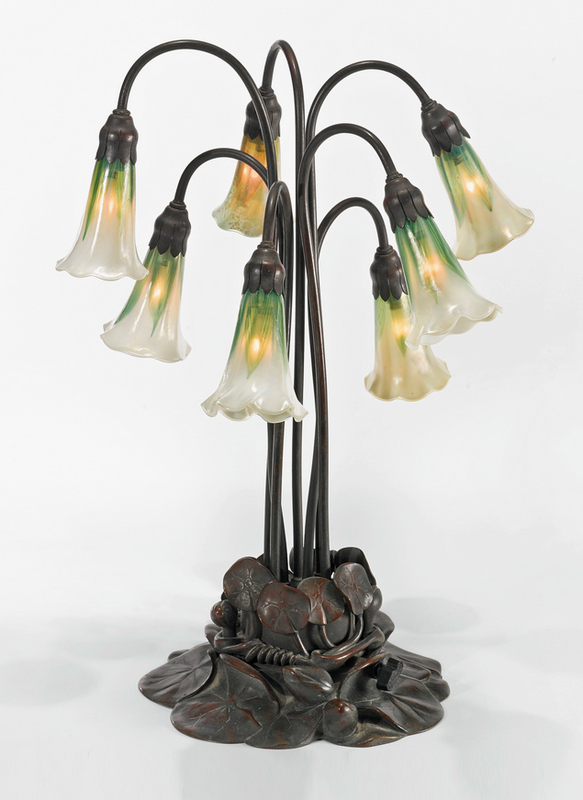 Take lot #163, a Tiffany Moorish chandelier, estimated to sell for $20,000 – $30,000. It realized $133,100, including buyer’s premium — over four times the high estimate. It was a rare, beautiful chandelier with turtleback tiles and Favrile glass balls, matching the design of original Tiffany Studios’ chandeliers from the Belasco Theater in New York City. 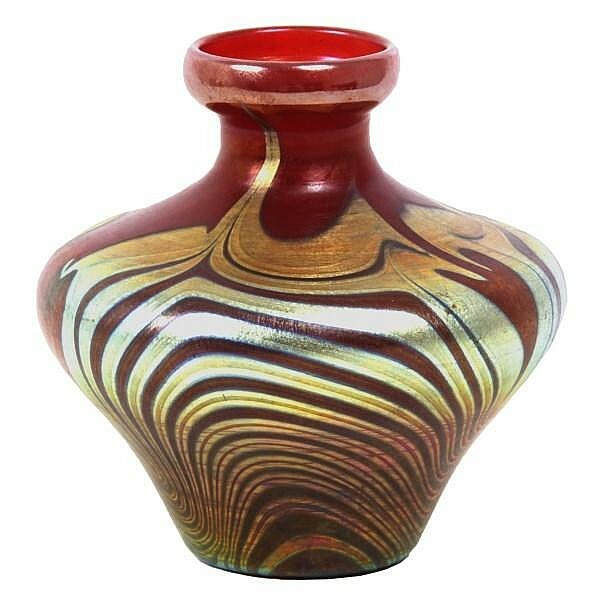 I tried to buy a stunning Tiffany red decorated mini vase, Fontaine lot #178, but was unsuccessful. It realized $9,982.50, against a pre-sale estimate of $6,000 – $8,000 — too much for a dealer, but fair for a collector. Top lot of the art glass shades was #205, a rare Steuben set (Roberts #202). Estimated to sell for $1,000 – $2,000, it realized $5,989.50.